Here’s a video tip on how to adjust the suspension on your dirt bike. Read the full article on How To Adjust Suspension On A Dirt Bike here. Here’s a quick tip on how to adjust the suspension on your dirt bike if it has adjustable forks or shocks. The purpose of adjusting it is to make the suspension perform at its best on certain types of terrain or size/shape of obstacles. The faster you go, the stiffer you’ll want your suspension to be. If you are a trail riding, then you will want it to be softer than it would normally be for riding on a motocross track. There are two things you can do to the forks without changing your springs, and these are adjusting the compression and rebound speed. As seen in the picture above, number one shows where the clickers are for adjusting the rebound on the bike, and number two shows where the clickers for changing the compression speed on the forks are. To slow down/stiffen either the compression or rebound on the forks, you will want to turn the clickers in/clockwise with a screwdriver. You will hear a “click” about every half turn, and all the way in is about 15 clicks for most bikes. You do the same thing for speeding up/softening the compression and rebound, but instead of turning the clicker in you will turn it out/counter-clockwise. It’s basically the same routine for adjusting the shock, but the clickers aren’t in the same spots. Number three shows where the rebound clicker is on the shock, and number four is where the compression clicker is. The shock is usually around fifteen clicks also. If your bike still has stock suspension and it’s not extremely worn out, then the stock springs are usually set up for about a 130-165lb rider for motocross. If you weigh more than that, you’ll want stiffer springs, but if you weigh less than that then you’ll want softer springs. Another pointer when you’re adjusting you clickers is that you want the forks to be equally adjusted. What I mean by that is when you adjust the right side of the forks compression or rebound, then you will want the left side to be the same, otherwise it might not feel right or be as consistent. This does not mean that you have to have the compression adjusted the same as the rebound for either the forks or the shock. I usually keep them the same because I am not the fastest rider and tiny adjustments like that aren’t really noticeable for me. If you are picky about your suspension then you make little changes by having different combination settings (check out the Adjusting Your Spring Rate article for more tips on suspension). If you have any questions, feel free to comment. Thanks for viewing, and good luck! Changing oil on a motorcycle is simple, but sometimes it is too simple that people forget to change it, and then they wonder why their bike just seized. If you’re on a street bike, and you use it often, I would recommend changing it every few months, just so that the oil doesn’t get dirty and start damaging internal engine parts. 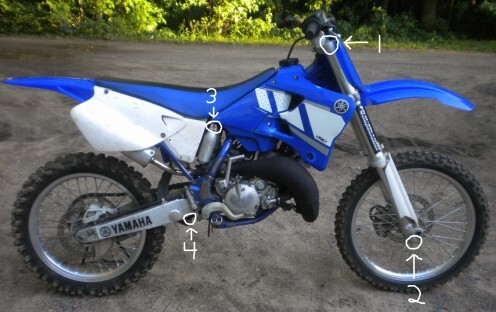 Off-road bikes, or dirt bikes, are probably the easiest. All you have to do is check the oil level and color every time you ride. If it starts getting low then you should probably change it soon. If the color is gray, that means it is getting dirty and a oil change should be done in the near future. If the oil is black, then you definitely want to change it because it is old and probably getting dirty. If you don’t ride everyday, then I would suggest changing your off-road dirt bike oil two to three times a year. Motocross dirt bikes require a little more maintenance for pretty much everything. Regular oil changes are key, especially if you are racing. 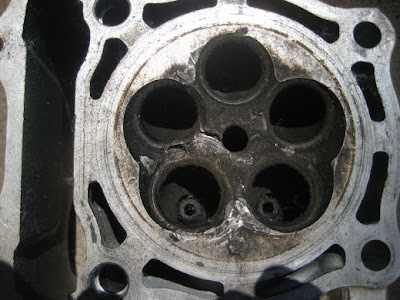 If you haven’t changed the oil in a while and you go race, then there’s a slight chance that you will lock up the motor, and that is not what you want to happen during a moto. I suggest changing the oil on a motocross bike every 3-5 races. Possibly more if you’re riding a lot in between race days. Good luck, and don’t let that bike run out of oil! !